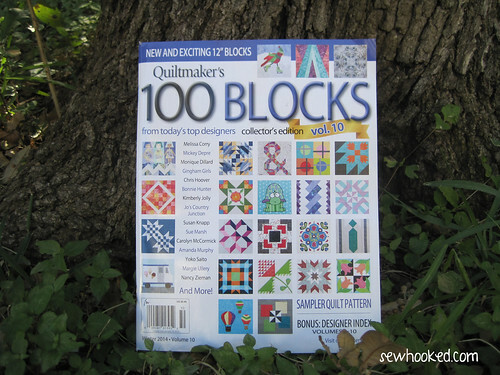 Welcome to my FIFTH blog tour for Quiltmaker’s 100 Blocks, I am so excited you’re here! Be sure to read to the end to learn how you can win a free copy of the magazine. My block for this issue, Jewels of the Wind, can be found on page 31. This block is extra special because it was inspired by my best friend, Jewells. She lives in Albuquerque, and fall for her means hot air balloons filling the sky! This amazing photo was taken in Albuquerque by Marvin on Flickr. See Jewels of the Wind there on the bottom left? This never gets old! Jewels of the Wind was designed in EQ7! Here we are, on page 31. This is the version of Jewels of the Wind that I made to share in Quiltmaker’s special videos about Volume 10. Volume 10 means there are now ONE THOUSAND BLOCKS. Isn’t that fantastic?! Check out the 100 Blocks, Vol. 10 Pinterest Board for more great photos & videos! 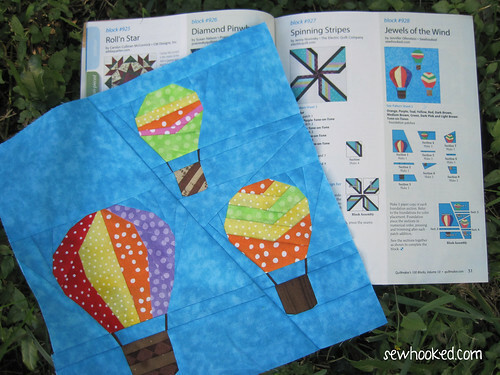 I was thrilled to see Jewels of the Wind pop up in the Block Tester’s Gallery on page 94. 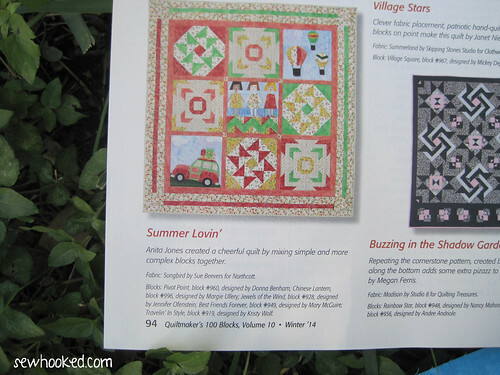 This sweet summer quilt by Anita Jones includes several of the 100 Blocks from this issue. Want a chance to win a free copy of Volume 10? Just share your favorite autumn activity in the comment section by November 23, 2014. Winner will receive his or her copy directly from Quiltmaker! I will have a limited supply of signed copies for sale in my Etsy store. These are currently listed as “pre-order” because I am waiting for my copies to arrive. I’ve been assured they are in transit, so the moment I have them, they’ll be shipped out to you! Each month, I give away a fun prize, often a pattern from my Craftsy Shop. In November, share ANY project designed by me (from Craftsy, sewhooked.com,fandominstitches.com, Quiltmaker, etc.) 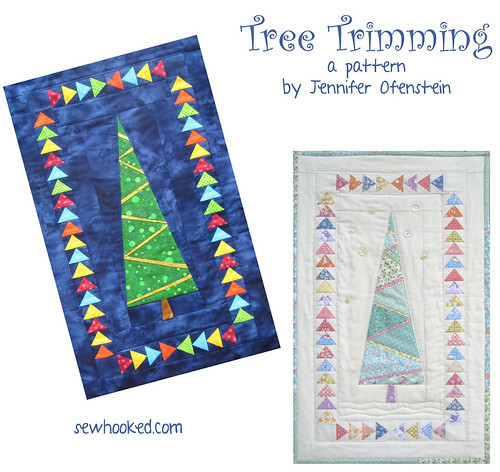 with the Sewhooked flickr group and be entered to win a free copy of one of my most popular patterns, Tree Trimming! This entry was posted in Blog Hop, Events, Quiltmaker Blog Tour and tagged 100 blocks, 100blocks, blog tour, jewels of the wind, quiltmaker, quiltmaker 100 blocks blog tour on November 20, 2014 by Jennifer Ofenstein. My favorite autumn activity is traveling to California and going to quilt shops! I enjoy sewing and quilting for the Christmas season and like to get an early start. In autumn I get busy finishing up projects around the house before the rains arrive here in the Pacific Northwest. It’s very satisfying to check those things off my list (actual list or mental list) and then be able to settle in for the rainy winter. Congratulations on your pattern in 100 blocks. Of course sewing is my favourite autumn activity but I also love cook all those wonderful comfort meals… casseroles in the slow cooker, apple pie in the oven… mmmm yummy! I love to pick apples, not clean the gutters. Your block is wonderful but the Tree is grand! I love to walk on the beach on crisp mornings—-watch the sun come up and let the gentle breeze keep me cool while I walk in the sand! My favorite fall activity is to pick apples and make apple sauce, apple butter and apple juice from them! Your hot air balloons are wonderful! My favorite Autumn activity is hiking at our state park. Love to see the fall colors. Autumn time has always been apple time at our house. Making applesauce is my favorite fall activity. My favorite is shopping for new quilt supplies for Christmas. Raking leaves is NOT my favorite activity – but taking some road trips to look at the beautiful leaves is a favorite activity. And of course you have to check out the quilt shops in your travels. Beautiful balloons and lovin’ the tree too. I love walking in the woods and crunching in the leaves. My favorite autumn activity is to go to the mountains before the snow arrives. I love hiking in the fall! Thanks for a chance to win–love your block! Love camping in the Fall. Would love to go to Albuquerque some time to see the hot air balloon festival. It has been on my bucket list. I love walking in the woods through the fallen leaves. You have a wonderful block! My favorite autumn activity is walking on a sunny crisp day. Thanks for the chance! My favorite Autumn activity is walking through a woods and looking at the beautiful leaves on the trees. My favorite Autumn begins wtth Halloween. .creating costumes, crafts and treats..then once into fall with the abundance of apples it’s time for baking pies and other goodies. I love raking the leaves for the grand children to run and jump in them We also like to have a bonfire more in the autumn than any other season. ooh in the autumn love to seek out farm stands and get all those late growing season goodies….and cider! and what a fun block! we have a balloon festival here in maine and it is awesome to be close to them as they rise in the sky! Good morning… I live in the metro Atlanta area, and the west side of town has a mini shop hop of 6 quilt shops called the Corn Maze. For the past several years I’ve been one of the volunteers working at my local shop, usually I’m sewing on one of my treadle sewing machines, doing a demo of something simple that folks can whip up. This year I did criss cross coasters. I enjoy seeing all the new faces and participating in their excitement over the up coming holidays. They love sharing their quilting projects with us while we stamp their passports and hand out the goodie bags. I love to walk through the forest and eat some hot chestnuts! Fall and an outdoor bonfire to roast hot dogs and marshmallows is my favorite fun time activity. We have a huge maple tree up on our hill, I love watching it change from bright green to all the brilliant fall colors. I love walking in the fall especially around sunset. Lovely block and congratulations on being on the cover again!! Great block – my favourite today! leaves and do the shop hops at the area quilt stores. Building a bonfire in the cool evenings and sharing with family and friends. I love a pot of chili on a cool autumn evening! Thanks for the giveaway. just walking through the woods, crunching the leaves with my grandchild is the best! My favorite autumn activity is yard work. I actually enjoy raking leaves and cleaning up the lawn and flower beds! Getting all the bindings on my quilts, so when the first chilly weather hits, I’m gangbusters ahead with warm comforting quilts on my lap. Sewing the bindings on my quilts so when the first chilly weather hits, I am nice and toasty working on my quilts. Sorry didn’t mean to post twice, my computer burped and couldn’t find my first post. Congrats to you on your new book. I love looking at hot-air balloons and this block is very stunning. Just love the colors. I love being nice and warm and quilting my little heart out. Thank you for being a part of this Blog Tour and the chance to be able to win a copy of this awesome magazine. My favorite autumn activity is walking through dried leaves on a cold, windy day. I love your block it is so bright and pretty. Beautiful with the colours! They remind me of sailing ! I love to drive through the countryside and see all of the colorful leaves! And fall means winter is close so I get to quilt with my neighbor on weekends! Autumn is hiking time on trails and the parks to see the wonderful changing tree colors and hot apple cider. Sitting around a fire pit, drinking hot apple cider with friends, nothing better! I love walking and scrunching in the fallen leaves. I use to love jumping in the piles of leaves ( I still do) but I don’t bounce as well as I used to. Fall. Can’t wait to make this block. My husband loves hot air balloons. We don’t have fall here :(; so sad because I love how is it… I had the chance to live a fall some years ago… adore the color of the leaves and the breeze…, we went to pick some apples, among other things, hmmmm I miss it!!!! Looking at the pretty fall leaves. One of my favorite fall things to do is go to a quaint shopping village in PA where they hold an annual scarecrow contest. All of the shops participate and the autumnal decor is fabulous. Your block is gorgeous — I’m going to incorporate it into something for my sister who has been to the AZ balloon festival. Carving pumpkins is my favorite. My favorite autumn activity is doing things out doors because the weather becomes much cooler hereabouts. We didn’t have a very long autumn this year as “winter” hit us early! (I’m in Texas — San Antonio area). We were shocked to get 30 degree temperatures last week. Congrats! That block is awesome! Autumn is for me a time to quilt and to cuddle up under a tv lap quilt and watch my favorite shows. Thanks for the fun and congrats. I like to take my camera and go for a walk in the park and take pictures of all the amazing fall colors. Thanks for giveaway. My favorite autumn activity is taking (doing) things out doors. The weather turns much cooler hereabouts. However, “winter” hit us early this year! We were shocked to get 30 degree temperatures last week. My husband’s favorite activity, duck hunting, comes in the fall so when he is away I gear up to sew! Your block is lovely! My favorite autumn pastime is walking in the forest with my dogs. Fall is my favorite season! I love going for a walk and picking a variety of leaves. – but now they’re covered with snow. My favorite Autumn activity is going for the drive in the forest loop and seeing all the changing leaves. It is so breathtaking and I love fall with the wonderful colors. Congrats on being chosen to be in the magazine again. I love the hot air balloon block. My favorite autumn activity is walking in the sand at the beach! I live in Honolulu and the beach is wonderful at this time of year—before the storms and big surf come! Aloha! My favorite fall activity is knitting and quilting while I am indoors but I love getting out and taking pictures. Fall is such a beautiful time of year! I love your block. We have a small hot air balloon festival here in CA and it’s really neat! I love to go camping in the fall (the hubster calls it hunting, but if he wants to traipse around in the mud and gunk, so be it). Walking in the trees that are turning colors amongst the pines lifts my spirit. I love your block! We have a hot air balloon festival here in Boise as well, so your block hits close to home! Your block is so beautiful. I love hot air balloons. My favorite autumn activity (besides quilting) is camping. Congratulations on being chosen for the magazine and thanks for sharing with us. My favorite activity would be going for walks in the fall, winter, spring, summer…..and so on! 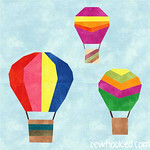 Just love the hot air balloons, so fun for putting into a quilt to cheer things up. One of my favorite Fall things is looking up and seeing exactly the picture of your inspiration and another favorite follows days later when I see, and hear, Sandhill Cranes migrating south along the same river path the balloons follow. What a beautiful block, as usual and paper pieced, which makes it so fun! My favorite thing to do in the fall is walk through crispy leaves on the ground and smell all the fall smells. What I remember from childhood is the smell of burning leaves, somehow that was always a good fall smell. Thanks for sharing your talent with us. I enjoy driving through the country side and watching the turn their brilliant colors. Wonderful block and it reminds me of the time my husband and I along with 3 other people took a balloon ride. We also have a Spiedi festival here and the balloons go off in a local park. Sometimes they go over my house. My favorite Autumn activity is driving around looking at the fall foliage. Thanks for a chance to win. My favorite fall activity is going for walks. Love your balloons. Favorite Fall Activity would be Halloween. We turn the end of our garage into Harry Potter Greenhouse scene and he dresses as HP. I’m Prof. Sprout and we give away little plants as well as candy. So much fun for us, and educational for the kids, too. Even the parents get into it all. I enjoy picking apples and making applesauce and other treats. I really like your colorful block. It is cheerful and the possibilities are endless. Congratulations on making another issue! Love the block. Congratulations and thank you for the giveaway. I love walking around outside and working in my flower garden. Jewels of the Wind is AWESOME! Just knew the inspiration had to be AlbuquerqueAnd my favorite autumn activity is listening to Husker (Nebraska) football on the radio while we are driving through the backroads, prairies, and sandhills of Nebraska. My favorite Autumn activity is leaf watching. Such beautiful colors! Love your cute block! I love to make pies, cakes, etc., from the wonderful apples of fall. Congratulations on your block being in the magazine. It is a cute block. I would love to go to a balloon festival someday, the pictures are gorgeous. My favorite activity is Apple picking. My favorite Autumn activity is wrapping up in my sweater or a quilt with a hot beverage in my mug and sitting on my porch. Sometimes I read and sometimes I just watch things/people, either way it’s something that I enjoy greatly! My favorite activity year round is sewing. Next to that would be reading while drinking a hot cup of coffee with some kind of flavored cream. Fall means squash and all the other vegetables we have from our garden. So sad when they are all gone, but look forward to starting new plants in March! I just adore this block– so cheerful and lovely! My favorite autumn activity is walking through the crunchy leaves- I just love that sound! Fall signals vibrant colors and diminishing warm days in Minnesota. Every sunny day is an opportunity to enjoy a ride with the top down in our Mini Cooper.. even if you need the heat on full tilt. Love to walk in the woods this time of year. Leaves are beautiful and not too cold yet. I enjoy looking out the window of my “craft cave” watching the leaves turn into a beautiful colorful sight to see. My favorite fall activity? Attending local craft festivals, raking leaves, and leaf watching. My new favorite fall activity is attending a 4-day Quilt Camp held in Johnsonburg, NJ with attendees coming from 2.5 hours south of there. It is an escape to a (usually) church camp in the beautiful forested hill country up north. Such fun and relaxation with like-minded quilting women. I’ve already committed for next October – the 16th year for some of the ladies. I enjoy going to watch the hawk migration through my area of PA. I love the fall colors and walking thru the leaves on the ground. I love to take photos of the fall colors to see if somehow I can make a quilt with them….more photos than quilts but lots of ideas. Beautiful block. We have a hot air balloon race in Reno Nevada in September. The colors are so gorgeous. My favorite fall activity is working in the garden. I do love those hot air balloons. So colorful! My favorite autumn activity is enjoying Balboa park here in San Diego. My family likes to walk around the park with hot chocolate in hand and just enjoy being outdoors. Congratulations. 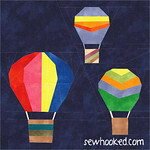 This is a very fun block and how fun to be able to make the hot air balloons in so many different fabrics. My favorite Autumn activity is picking apples to can and freeze for the winter months. Being able to start cooking in the oven again without battling the heat! My favourite autumn activity is walking through the fallen leaves. Favorite Fall activity is going to an orchard..pickin’ own apples…canning them, making Applesauce & I learned to make Apple Butter this year!! YUM! Last Saturday I drove to a nearby town taking an old country route with the most beautiful autumn scenery. Even the fallen leaves were golden. That’s my favorite thing to do in autumn; just experience its beauty. Love your block. The Albuquerque Balloon Fiesta is one of my favorite fall activities. There are many great things to do in the fall. One of my favorite activities is going to college football games. Color tour of the beautiful fall colors. Thanks. What a colorful block! My favorite autumn activity is taking a scenic drive to the mountains to see the beautiful changing leaves. Love those balloons! Colourful alsol. I like the colours of fall! Walking in crisp air but not so cold I am freezing! Best time of the year. Congrats on being in Issue #10. I love trick-or-treating with the kids! My favorite fall activity is traveling the Blue Ridge Parkway to see the fall colors. Thanks. 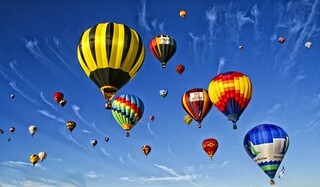 We have seen the balloon festival in Albuquerque….it it totally AWESOME! Fall is such a beautiful time of the year…the colors are perfect for making a quilt! That is a beautiful block. We have lots of hot air balloons here in southern California but nothing like Albuquerque. We don’t have a big change of seasons either but I love going up into the mountains for the colors and apple picking. autumn is the best time to go out and take pictures … great color, skies, light, lots of birds! I love finding new soup recipes to try each fall. My favorite autumn activity is walking through the leaves–reminds me of when I was a kid jumping into the leaf piles my dad raked together. Fun block–congrats on being a cover girl! My favorite Fall activity is going to the State Fair. Thanks for the giveaway. Your block is great! I like planting spring bulbs in the autumn. Riding my horse around the farm…not too hot, not too cold, just beautiful! My favorite autumn activity is just walking in the wind. There is nothing like feeling that air on your face and breathing in all the smells. The birds are busy eating before they leave and life is just wonderful! Going for foliage rides is the next best thing here in Maine…we have some wonderful autumn color. Awesome block! some may think I’m crazy but I love to rake leaves. It’s great exercise! I’ve joined a walking group for Mon/Wed/Fri morning walks,. Love the cool fresh air. Leaves changing colors. Living in the sunshine state of Florida, we really don’t have the change of seasons like our northern friends. What I do enjoy doing is bringing fall insoodrs. I also enjoy the cooler weather and the upcoming holidays. .
Well hot air ballooning has never even crossed my mind, let alone been my favourite fall activity! I do love your block though. In the fall I love reaping the harvest from my garden, hunting, walking in the bush and all the lovely colours. My favorite autumn activity is cooking, seconded by quilting. After the summer has trailed away I need something to keep me happy indoors and my mind starts dreaming up new recipes to cook and new designs to piece and quilt. Thanks for the opportunity to win this giveaway! My favorite fall activity is apple picking. I love to eat the apples freshly picked. 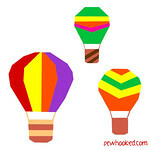 Love your block with the hot air balloons! Autumn in Florida means the start of outdoor art shows. I love spending the weekends appreciating the work of all types go artist and crafters. My favorite fall activity is walking in the park. Love your hot air balloons! I love smelling the smell of fall, and crunching leaves. This is such a cool block… I’m making this one for sure! I love everything about fall… mostly eating pumpkin pie! Anything to do with leaves — I love walking through the leaves that fall and blow as I walk. I even like raking leaves. I am always hunting those special colored leaves. I like taking fall drives watching the beautiful fall leaves in full color. My favorite autumn activity is taking a long 4 mile walk down the Cape Fear River trail. Leaves falling and the crisp cool air makes wearing my hat, gloves, and scarf so much fun! In Autumn I like to see the fall colors and visit a winery or three. I live in the Finger Lakes area of New York and we have both trees and wineries in abundance (as well as snow, right at the moment). I love walking in the woods and crunching the falling leaves as I walk…. My favorite Autumn activity is eating the wonderful fresh produce from our garden–tomatoes, acorn squash, broccoli, etc. Cute block! 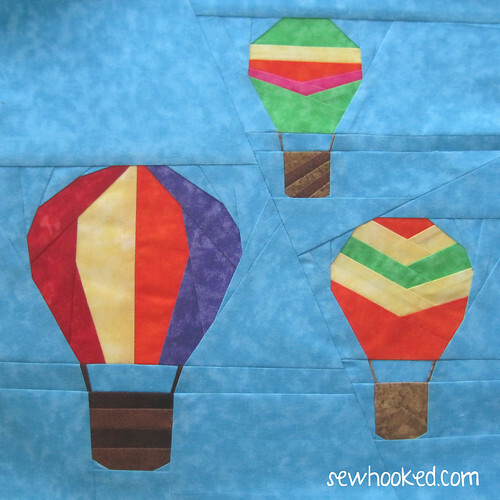 I have a friend who LOVES hot air balloons…I see a wall hanging in her future. I love being able to wear all my soft warm flannel shirts again. I love touring around checking out all the trees in their beautiful fall colours. We always take our family getaway in October…so my memories are full of family times as well as fall leaves and cooler temps! I love your block. It brings back memories of the last time I attended the Hot Air Balloon Festival in ABQ. My husband is from NM and it was always special to us. In the fall I love to attend Quilt shows to get ideas and pick up new quilting tools etc. and I love the Blue Ridge Mtns. fall colors as well as the ones in my front yard. Congrats on being in the new magazine. Thanks for the opportunity to win a copy as I cannot find it yet. Every autumn, we drive the Nebo Loop, which starts in Payson Canyon, Utah, just 5 minutes from my home. The loop drives through the canyon, past Mt Nebo, and comes down and out Nephi Canyon. The colors are spectacular, the views are wonderful, camping opportunities and hiking and lakes, and the altitude on the road reaches almost 9,000 ft above sea level. Aspen, oak, maple, pine and Blue spruce, with a backdrop of layers of red rock and granite. I want to design and make a quilt someday that reflects this breathtaking view. Definitely apple picking with a hay ride! duh, fast fingers. LOVE your hot air balloons! We took a hot air balloon ride in Africa and it was amazing! Great block! I love sewing all year round, lol love hiking in the fall! I like your Jewels of the Wind. I just enjoy the cooler temperatures of autumn. My favorite fall activity is bird hunting with our 2 dogs and 4 wheeling. Cute balloon block. Some day I would like to see that balloon festival. I am a bird watcher so I love the migration season in the fall and spring! great block! thank you. I enjoy the cooler temps after our super hot TX summers! We don’t always have ‘fall’ color but I enjoy whatever we get! I enjoy walking along the beach in temperate weather, before the “winter storms” and big surf! My favorite fall activity is just taking a walk on a sunny day and seeing the leaves changing. Baking apple pies from scratch! Can so taste one now!!! My favorite fall activity is camping, and sitting around the fire at night, smelling the leaves and relaxing (at least until it gets too cold! There are so many wonderful fall activities. I love sitting around the fire with family and friends, roasting hot dogs and making s’mores. Autumn means pumpkins, and I always bake sugar pie pumpkins, puree the flesh, then freeze it for yummy muffins all winter long! Drives through the mountains during the changing of the leaves. What a great block! So colorful and fun! Congratulations on being in Quiltmakers 100 Vol.10! Favorite autumn activities include going to the pumpkin patch with my grandson and traveling to Apple Hill with my quilt group. You have designed another great block! We have lots of hot air balloons flying over our house, so this is definitely one I need to make. My favorite fall activities are carving and cooking pumpkins! Getting out to see the Fall colors and taking pictures of them is a favorite Autumn free time activity. Walking in the crunchy leaves. My favorite Autumn activity is cooking for thanksgiving. The maple leaves in Kyoto are so photogenic, my favorite activity is going around town on my bike, trying to capture them on film! Baking and quilting, of course. My favorite autumn activity is to walk or ride my bike in the crisp autumn air. If it gets to cool then its to the sewing room I go!! Autumn means cooler temperatures and we can go camping in the desert. Leaving tomorrow morning for camping over Thanksgiving. Hi! My favorite fall activity seems to be getting ready for Christmas. Living in Hawaii, I mail most of my Christmas gifts to the mainland in early December. I also have my grab bag gifts and gifts for my local friends and family to work on.